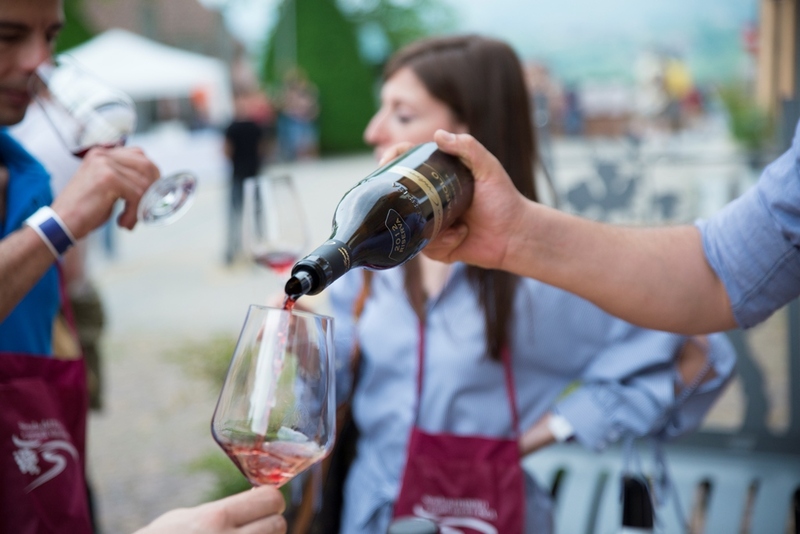 In the first six months of the year, the association Strada del Barolo e grandi vini di Langa has proposed many different events for wine lovers and tourists from all over the world… and for next Autumn a program full of activities is already on schedule! The strengthening of the wine tourism offer in the Langhe area remains the main guideline for Strada del Barolo. In 2018, the consortium has launched several new projects to promote the territory, aiming at attracting an increasingly greater and more qualifying number of tourists and wine lovers to help them discover the beautiful hills now declared a World Heritage Site. Since the first months of the year, the activity has grown a lot, both for what concerns the organization of new initiatives such as dinners with the participation and involvement of the wine producers, and at the promotion level with the production of new identifying plates for its members, new tourist maps with the list of the members and a new video to promote the territory and the activities of Strada del Barolo. Alongside the news, there are also many confirmations including the flagship events of the association such as: the Treasure Hunt in the Langa of Barolo® and Io, Barolo, which is re-proposed with a completely renewed structure that has already received an unprecedented appreciation. Among the main novelties proposed in 2018, there is a set of dinners organized in the months of March and April with the wines of some producers of Strada del Barolo, paired with the cheeses P.D.O. Bra, P.D.O. Raschera and the P.D.O. Raw Ham of Cuneo. This event, entitled “Langhe on the Table”, will be an exclusive food event organized in Torino in the restaurants members of the network “Wineat” and at the MorganteCocktail&Soul of Milano. The same event was already proposed in five restaurants of Langhe members of Strada del Barolo with the name “Dinner with the Winemakers”. During each appointment, a wine producer was involved in order to take actively part in the evening, personally presenting and serving his labels, while an expert was explaining the top quality food products to pair with each wine. Tuesday, 1 May 2018, there was the 9th consecutive edition of the Treasure Hunt in the Langa of Barolo®, main single event of Spring, organized, as usual, in cooperation with Turismo in Langa, the city of Alba and other involved municipalities. More than a thousand participants, divided in 240 crews by car or motorcycle, explored the different itineraries which, starting from the booths of “Vinum” in the centre of Alba, developed along the hilly territory of Langhe in order to find the hints and reach the final treasure. It was a unique occasion to visit ancient hamlets, wine cellars and tourist facilities members of Strada del Barolo. Saturday May 26th 2018, it was the turn of Io, Barolo 2018, the most important event of the year for Strada del Barolo. The event, organized for its 6th consecutive year in the historical centre of Roddi, welcomed more than one thousand wine enthusiasts from Piedmont, Lombardy, Liguria, Emilia Romagna and other Italian regions, as well as groups coming from other countries. The programme, completely renewed, had the Barolo wine as its unique protagonist. Barolo was presented in all its many facets by more than thirty producers who proposed a tasting of different crus and vintages: a real “journey” to discover the “King of Wines” along the narrow streets and squares of the medieval concentric centre of Roddi. Alongside the main event, there were also some side initiatives to deepen the knowledge of Barolo and the great wines of Langa with the guide of an expert. In fact, with the Food&Wine Experiences it was possible to try gourmet pairings between a selection of Piemdontese wines and some top quality food products, while in the Wine Tasting Experience® 4.0 the public was guided in the wine discovery using their sensorial perceptions. For the entire evening, the cooking school Terra Academy served a selection of traditional dishes with the products of the members of Strada del Barolo. Sunday May 27th 2018, the day after Io, Barolo, another brand new activity was “The Barolo vineyards: Tour of the “crus” with tasting”: a tour through some of the main Barolo producing areas for a group of some 25 people, with the guidance of a wine expert and a naturalist to understand, in a very simple and “experiential” way, the factors that determine the traits and many facets that Barolo can have. The tour followed a circular route, with stops in three “crus” in the municipalities of Serralunga d’Alba, La Morra and Barolo, and ended with a tasting in the wonderful panoramic terrace of Castiglione Falletto. Saturday 27th and Sunday 28th October 2018, another appreciated event will be the “Rendez-vous on the Barolo trail”, an entire weekend dedicated to all the wine and Langhe lovers who will have the opportunity to visit the wine producing companies, meeting the producers and tasting their wines. The restaurants members of Strada del Barolo will propose specific menus with traditional local dishes, museums and castles will be open with guided tours and, just for these two days, tourist accommodation facilities will propose special packages and discounts! Having become, over the years, an event not to be missed for hundreds of wine lovers who are visiting Langhe, the Wine Tasting Experiences®, original tasting event conceived by Strada del Barolo, will continue also in 2018. In Autumn, the calendar of meetings will be scheduled during the International Fair of the White Truffle of Alba. In all likelihood, the Food & Wine Experiences will be confirmed, allowing the visitors to pair the tasting of the great wines of Langa with a selection of top quality food products. Following the example of the French Ecole Du Vin, these appointments go beyond the traditional tasting in a wine cellar especially for the opportunity to compare labels from different producers at one appointment. Added value for the wine lovers is that the tastings are guided by territory experts capable of explaining the secrets of the wines and ready to satisfy any curiosity: the “teachers” are, in fact, producers, oenologists or skilled sommeliers. The website www.stradadelbarolo.it is a showcase of excellence for the territory and for all members who have access to a page with geo-location on an interactive map, photo gallery, service details and a detailed description of their activities. The site also features in-depth sections on territory, wines and gastronomic products, as well as tours and tourist packages. The mobile version makes all these contents easily accessible also via smartphones and tablets, thus widely improving the website accessibility. Parallel to the site, the online promotion activity continues through the “social channels” Facebook and Instagram, with a daily update of the profiles and through advertising campaigns that are able to attract a wide audience of users interested in wine and Langhe. The promotion is not only through Internet. In fact, in 2018 the distribution of new identification plates to all the companies members of the association has been completed and the new folding tourist maps have been printed. The maps include a list of the members, their geo-location on the map to indicate their exact position: two useful tools for tourists and wine lovers to find and recognize wine companies, restaurants, accommodation facilities, food producers and museums members of Strada del Barolo. Last Spring, also the new promotional video of Strada del Barolo was presented. The video, edited by Storie Doc, by Tiziano Gaia and Andrea Tomasetto, is a virtual stroll” to present the opportunities offered by a territory which has no equal in the world; an itinerary made by taste, excellence and tradition, going through all the seasons! Aiming at giving visibility, also outside Italy, to all the company members of our consortium, we go on with the educational tours addressed to foreign journalists, an activity started years ago by Strada del Barolo in cooperation with the consortium of promotion I Vini del Piemonte. The invitations are addressed to journalists of the sector coming from the main target countries, with the purpose to organize a good 10-15 press tours, which include tastings in wine companies, dinners and overnight stays in the facilities members of Strada del Barolo, sightseeing tours, visits to castles and museums etc. With the purpose of attracting to the associated facilities an increasing number of tourists from all around the world, Strada del Barolo will make use, again in 2018, of a monthly newsletter sent to a database of 10, 000 wine lovers and journalists all around the world as well as the press office activity and tourism promotion carried out during the international events organized by the consortium of promotion I Vini del Piemonte in several European and non European countries. Also all the collaborations started over the years with boards and institutions will be confirmed and strengthened. Said institutions are connected with the wine, food and tourism sectors, including companies related to the food production of excellence as well as other wine areas and wine trails both in Italy and in Europe.